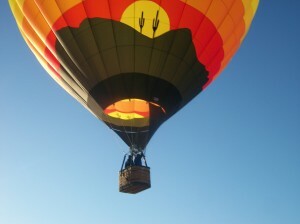 Learn how to fly a hot air balloon in 10 days in Phoenix. We offer hot air balloon pilot training so you can earn your LTA license. Get started now! Learn to fly a hot air balloon in 10 days. If you've been kicking around the idea of becoming a hot air balloon pilot, it's time to take the leap and earn your lighter-than-air certification. Whether you've been around balloons your whole life or you're entirely new to the sport, our flight training will give you the skills you need to become a safe and confident pilot. A student pilot training in a hot air balloon. During our flight training, you'll learn the skills you need to fly with confidence and pass your FAA check ride. 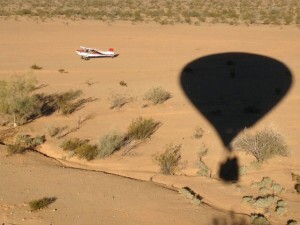 A student pilot solo flight in a hot air balloon. A solo flight is one of the exhilarating steps you'll take on your journey toward earning your pilot's certification. A view from a hot air balloon. Get above it all, learn to fly, have fun, and achieve your private or commercial pilot certification. $450.00/hour flight time, plus fuel. Learn to fly a hot air balloon in sunny Phoenix, Arizona. You can earn your private pilot certification in as little as 10 days during the winter months. Have your own equipment, earning an additional certification (commercial), or other specific requirements? Give us a call to discuss your situation. I always say that flying is the easy part. Studying for, and then taking, the written exam(s) is the tough part of becoming a pilot. Before you visit me in Phoenix, I highly recommend that you take your FAA written exam(s). That way, when we're in the air, you'll be able to focus on flying and prepare for your oral exam in the form of an FAA check ride. Gold Seal Online Ground School: Geared toward fixed-wing pilots, but covers what you need to know in the form of helpful videos, interactive lessons, and notes. Many videos are free. Webexams.com: This website gives you access to questions and answers that come directly from the FAA written test. This is great practice as you prepare for your LTA exam. Computer Assisted Testing Service or PSI: Two approved FAA written test examination centers. Find your nearest test location at either website.